R admeister is a US supplier of tires, tracks, buckets and undercarriage parts for compact construction and agricultural equipment. Our philosophy is simple: offer quality products at low prices! Thanks to the latest manufacturing and distribution technologies, and the high level of automation, we are able to offer you high quality products at very competitive prices. Don’t waste time and money on other expensive brands or low quality alternatives! 95% of our orders are received within 1-2 business days depending on availability. 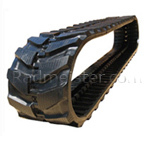 Radmeister rubber tracks are the best in their class and provide the highest value for money. Continuous cable structure, nylon-coated steel inner cables, heat-treated, forged steel links, and more rubber - Radmeister rubber tracks have it all. 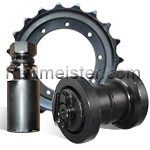 Radmeister provides replacement undercarriage parts for mini excavators and compact track loaders. Browse Radmeister.com to find sprockets , bottom & upper rollers , front & rear idlers for your machine at very competitive prices. Radmeister Tire Studs are an alternative to snow chains for skid steers, backhoes, and other equipment commonly used in snow removal applications. 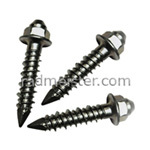 They are designed for jobs on ice and other slippery surfaces that would require greater tire traction. The solid carbide studs are easy to install on the tire tread, and just as easy to remove, leaving just a tiny holes on the tread lugs, without tire damage.